SALISBURY, England (AP) — Britain will respond “appropriately and robustly” if Russia’s involvement is established in the case of an ex-Russian spy who became critically ill after coming into contact with an “unknown substance” in southern England, the U.K. foreign secretary said Tuesday. Boris Johnson told lawmakers in the House of Commons that he wasn’t “pointing fingers” as to who might be responsible for the collapse of Sergei Skripal, who was found slumped on a bench together with his daughter Yulia on Sunday. But he stressed that if state involvement was proven, Britain would take action. “I say to governments around the world that no attempt to take innocent life on U.K. soil will go either unsanctioned or unpunished,” he said. The Foreign Office clarified that the comment referred to dignitaries and officials, not the England team, which is scheduled to compete at the tournament. British counterterror specialists took over the investigation from local authorities as they sought to unravel the mystery of why Skripal and his daughter collapsed in Salisbury, 90 miles (145 kilometers) southwest of London. Though authorities were trying to keep an open mind, the incident drew parallels to the death of former Russian agent Alexander Litvinenko, who was poisoned with radioactive polonium in 2006 in London. Skripal, 66, was convicted in Russia on charges of spying for Britain and sentenced in 2006 to 13 years in prison. He was freed in 2010 as part of a spy swap, which followed the exposure of a ring of Russian sleeper agents in the U.S. Both Skripal and his daughter are in critical condition in intensive care. A small number of emergency services personnel were assessed immediately after the incident, and police said Tuesday that all but one had been discharged. The discovery led to a dramatic decontamination effort. Crews in billowing yellow moon suits worked into the night spraying down the street, and the Salisbury hospital’s emergency room was closed. A pub and a restaurant remain “secured,” but police didn’t say how long the cordons would be in place. 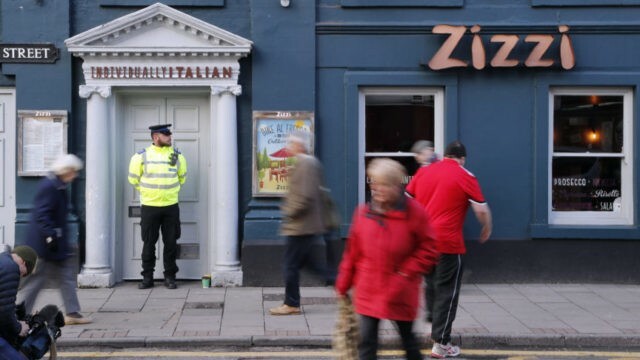 A security camera image of a man and woman walking through an alleyway connecting the Zizzi restaurant and the bench where Skripal and his daughter were found is believed to be of interest to police. Public records list Skripal as having an address in Salisbury. At the time of Skripal’s trial, the Russian media quoted the FSB domestic security agency as saying that the damage from his activities could be compared to harm inflicted by Oleg Penkovsky, a GRU colonel who spied for the U.S. and Britain. Penkovsky was executed in 1963. His illness was initially treated as unexplained. Evidence eventually emerged indicating he had been deliberately poisoned with the radioactive material. A British judge wrote in a 2016 report that Litvinenko’s death was an assassination carried out by Russia’s security services — with the likely approval of Putin. The Russian government has denied any responsibility. Despite the swirling discussions, little is clear. Mark Galeotti, the head of the Center for European Security at the Institute of International Relations in Prague urged caution, noting that it wasn’t yet clear what happened. He pointed out that in the past, Russia hasn’t tried to eliminate swapped spies “as this would spoil their chances of getting future exchanges” with the West. Kate DePury reported from Moscow. Danica Kirka and Jill Lawless reported from London. This story has been corrected to show that all but one emergency worker have been discharged, rather than remain hospitalized.